Patio doors for the home come in a broad range of materials, types and functions. To choose the right doors as well as the best material for patio doors, it helps to understand the options available. While doors are important of course, windows, screens and other products also play a part. A significant element of a home, patio doors provide access from any room to the outside. Patio doors also provide entry inside, ventilation and security. Chosen well they improve the appearance of the house too. 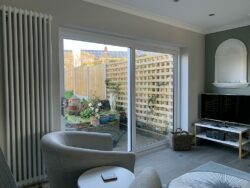 The benefit of patio doors, regardless of material, is their bigger glass sizes and increased natural light as a result. Choose a well-designed, attractive door and benefit from an improved living space, dining room or kitchen area. Information about patio doors for the home. Pivoting Doors, with an offset pivot at the top and a hidden floor spring. Slide and stack or slide and turn patio doors either fully framed or virtually frameless. Automatic sliding doors having hidden operators above them. A combination unit with more than one type of door opening method. Sliding doors moving around a fixed or open corner. As door design gets better and more sophisticated, patio doors now come with ultra-low thresholds and even no threshold at all. For instance, there are doors designed to offer varying levels of weather resistance as well as helping with disabled access. Glass options, colours, profile aesthetics and numerous accessories all work together to create impressive and durable patio doors for the home. Double glazed doors come with excellent thermally efficient units. In spite of aluminium being popular for new patio doors, there are good reasons to consider the other material options as well. 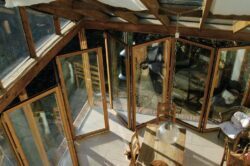 For instance, planning constraints, listed buildings or personal taste means timber or steel provides a better option. Helping you choose the best material for patio doors. For anyone looking to replace or provide new patio doors in their home, there is an excellent choice of materials. There is no absolute best material for patio doors. Nearly all modern patio doors all offer good design, colour choice, textures, high security and reliability. This especially applies to doors for external use. Doors designed for internal use often come with simpler locking systems and usually less thermal performance. While we are an aluminium focused website, we do not necessarily say aluminium is entirely the best material for patio doors. There are also many good reasons to consider the other materials too. Where the different patio door materials differ is in six key areas. Price whether by cost or brand. Appearance, such as contemporary or traditional. The capability of the product, such as sizes, strength and integration with other products. Security, weather and other accreditations. 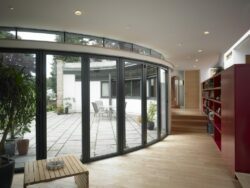 As well as these, patio doors now form an integral part of many contemporary extensions and houses. 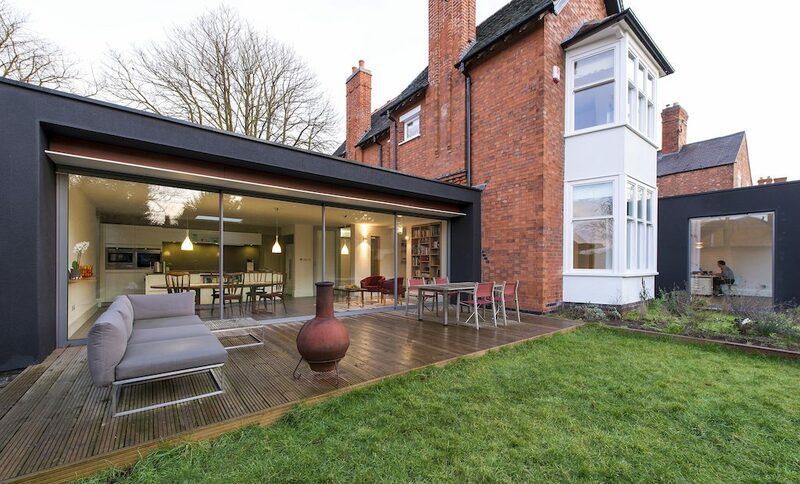 As a result, other external elements must complement and often work with patio doors. 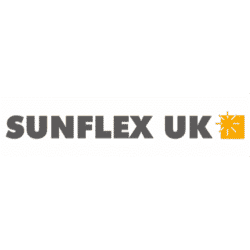 For example, cladding, gutters, fascias, corner posts and steelwork, aluminium panels and even integral blinds. To illustrate this, our main image on this page shows other structural and aesthetic elements also in coloured aluminium. Consequently, how your patio door works with your other design or structural factors also determines the choice of material or brand. In aluminium especially there is a big choice when it comes to finding who makes the best bifolding doors. 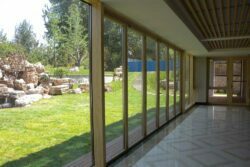 For sliding patio doors, there are over fifty aluminium sliding doors to choose from, so invariably its worth seeking advice on some of the best patio sliding doors on the market today. Types of patio doors for the home. All of these popular patio door materials provide a variety of patio door types and styles. To illustrate the different types of patio doors, our at-a-glance table provides an overview. Take a look at the different patio door types available in different materials. Always check with your chosen supplier or contact us with any questions. In aluminium, patio doors come with thermal aluminium sections for external quality doors or non-thermal for internal doors. These patio doors certainly offer the biggest variety of products including bifolding doors, sliding doors, hinged doors and many of the specialist patio door products on the market. The latest steel-look French doors and bifolds are aluminium as well as the latest and highly sought-after ultra-slim sliding doors. Pivoting, automatic and super-size patio doors also come in aluminium. By far, the biggest benefit of choosing an aluminium patio door product is thin sight lines, colour choices and aesthetics. As a result, aluminium remains the go-to product when seeking a contemporary appearance. PVCu patio doors are certainly the most cost-effective way to have new patio doors in the home. Typical products include single and double doors, patio sliding doors and bifolding doors. Modern steel patio doors offer excellent energy saving properties as well as good security and colour choices. Another benefit is the luxury and highly desirable timber-look PVCu patio doors offering superb attention to detail in quality and appearance. Therefore the current range of products is substantially better with a better product perception than ever before. When it comes to appearance, long life, thin profiles and the very best, steel patio doors are hard to beat. Patio doors in timber provide the best in thermal performance as well as a warm-to-the-touch material and very long life. Many homeowners presume that timber patio doors and windows require ongoing maintenance. In truth, modern timber patio doors come with excellent product and paint guarantees. Choose a quality timber patio door and you are certainly rewarded with a premium product. Timber looks great and performs faultlessly for many years to come. For this reason, timber patio doors are ideal in traditional as well as modern houses. Hybrid or Composite Patio Doors. The latest Hybrid patio door products offering highly insulated and desirable patio doors in a combination of materials. Hybrid patio doors come with aluminium on the outside and a choice of hardwood, softwood and other timbers on the inside. In fact, you get an individual looking product enhancing any home. They are robust, functional and desirable. Another benefit of hybrid patio doors is substantial colour combinations with over 200 colours externally. You get a choice of wood stains and colours internally. The latest generation of frameless patio doors provides virtually all glass interior and exterior doors. Only the essential elements come in aluminium. Frameless patio doors come as single or double glazed products, with varying levels of security, functionality and weather performance. The benefit of a frameless patio door is minimal aluminium profiles as well as the best possible views. Most frameless patio door products mostly come as slide and turn doors, although hinged glass doors, frameless double doors and frameless glazing are also available. Helping you choose the best patio doors for your home. Contact us using our contact form if you would like further help and advice choosing the best material for patio doors in your home. As well as doors, we also help with windows and general home improvement questions. We’re not just an aluminium information website; we can also help you with information abut PVCu, timber, steel and other materials too. We offer advice on virtually any product on the market and also help put you in touch with suitable suppliers.